Complexity: BeginnerData Requirement: Use your own dataGoal: Learn how to select a specific dimension value. You can select particular dimensions (slices) of a netCDF raster layer with a geoprocessing tool..
You can select a different slice of a netCDF raster layer, feature layer, or table by changing dimension values using the Select by Dimension tool. Auxiliary coordinate variables are not listed in the Dimension Values parameter drop-down list. 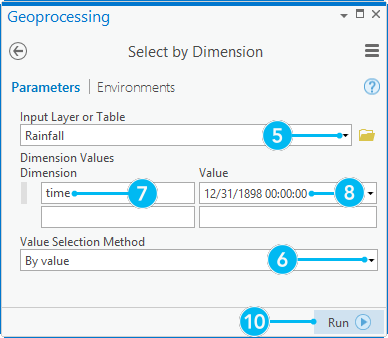 If you have a dimension that uses an auxiliary coordinate variable for storing actual values, such as time or depth, they will not be available in the Value drop-down list. If values are typed in, they will not be used during execution. Type Select by Dimension in the text box in the Geoprocessing pane. Click Select by Dimension in the returned list to open the tool. Click the Input Layer or Table drop-down arrow and select a netCDF layer or table from the list. Click the Value Selection Method drop-down arrow and select BY_INDEX to specify a dimension value by its position or index. Click the Dimension Values drop-down arrow and select a dimension from the list. Click the value field next to the dimension and select a value from the list, or type in the value if a list does not appear. Repeat steps 7 and 8 for other dimensions if necessary. ArcGIS Server includes support for WMS services based on multidimensional data. These services support the special keywords of TIME and ELEVATION on WMS GetMap requests. To support the ELEVATION keyword, the ArcGIS Server WMS service must know the name of the netCDF dimension that represents the vertical axis of the data. In the Vertical Dimension drop-down list, choose the name of the netCDF dimension that represents the vertical axis of the data. When the map document is published as a WMS enabled service, the specified dimension will be mapped to the ELEVATION keyword on GetMap requests. For more details on the parameters, please refer to Communicating with a WMS service in a web browser in the ArcGIS Server help. You can select a different slice of a netCDF raster layer, feature layer, or table by using the Select by Dimension tool.